Many men think about monastic life during the process of discerning their vocation in life. Our Vocation Director is happy to dialogue with you to discern where God’s will seems to be leading you. Our eventual response to a continuing interest is to “come and see”. This stage of the first contact helps you to learn about monastic life and encourages you to make some initial comparison between the reality you find at Tarrawarra and your spiritual aspirations. When prolonged prayer and reflection lead to a continuation of the process, a time of more intense experimentation is arranged. You will be invited to spend about three weeks living in the community as an observor. This is an important time of discernment. After observorship, if it seems good to proceed, you will be given an application form. When this has been returned, it will be discussed by the formation committee and, following a positive response, a date will be set for entry as a postulant. The postulancy is a period of six to twelve months during which the candidate adjusts psychologically to a new way of life, getting used to the different dynamics of living in the community and to the particular rhythms of the monastic day with its large amounts of time for liturgy, private prayer, study, and work. Reception into the novitiate and being clothed in the novice’s white habit is a joyful occasion for the man himself and the community. It is the formal beginning of his Cistercian life and the start of two years of intense personal formation and instruction. The task of the novice, assisted by his formators, is to learn more about himself and the specific demands of Cistercian life so that he can judge whether or not this is the way of life in which he can draw closer to God. At the end of the novitiate, following a vote of the community, the novice is invited to take the first step in his self-dedication to God by pronouncing the vows of stability of place, fidelity to the monastic way of life, and obedience for a trial period of three years. He does this at a simple ceremony during the Liturgy of the Hours. He now begins to wear the black scapular and leather belt indicating his status as a professed monk of the community. The four or more years following the first profession are geared to continue the process of self-knowledge, fuller participation in the community, and a broadening of mind and heart through a programme of monastic education. It is during this time that the young monk begins to express his monastic vocation in a more personal way, taking more responsibility for the life of the community, allowing his gifts to flower and finding in the monastic way of life a pathway to personal freedom and fulfilment. The definitive act of the Solemn Profession follows a lengthy period of discernment by the man himself with the formators and the favourable vote of the Conventual Chapter. The taking of solemn vows occurs within the context of a Eucharistic celebration attended by the community, family, and friends. 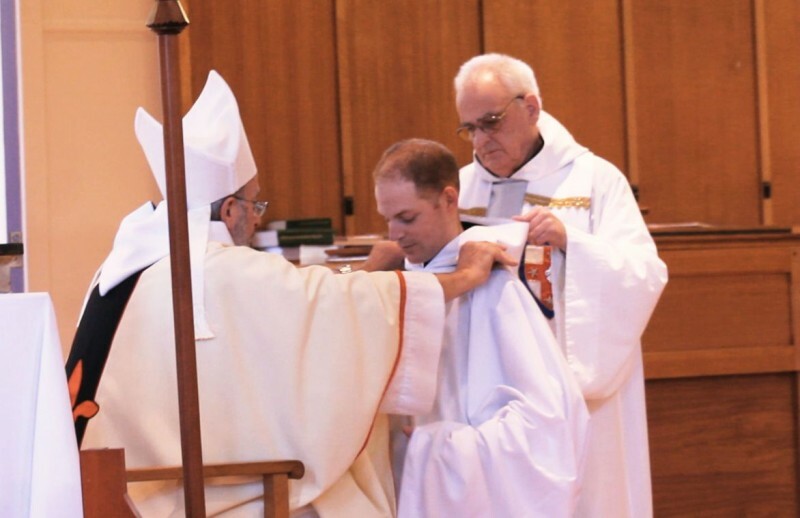 At this time the new monk receives monastic consecration, described in tradition as a “second baptism” and is clothed with the white cowl that signifies his full membership in the Cistercian Order. The Church responds to his gift of self with a prayer for the outpouring of God’s grace of holiness, the innocence of life, the fullness of charity, and the gift of perseverance. In Cistercian communities, there is a parallel pathway to monastic life which is appropriate in particular circumstances. A man who becomes an oblate passes through similar stages of initiation but he receives a different formation and does not take vows but makes a formal commitment to the community and to the living of the monastic way of life. 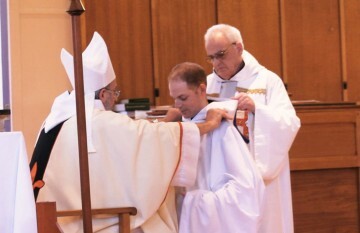 After the Solemn Profession, some monks are ordained to minister the sacramental needs of the community, but this is, as it were, a second vocation. When, following discernment, community needs and personal desire point in this direction, the monk undertakes a course of studies that will equip him to fulfil the duties of this office in a way that is fruitful for himself and the community.